Kernaghan, Lois. "Anna Haining Swan". The Canadian Encyclopedia, 28 July 2017, Historica Canada. https://www.thecanadianencyclopedia.ca/en/article/anna-haining-swan. Accessed 24 April 2019. Anna Haining Swan, giantess (b at Mill Brook, NS 7 Aug 1846; d at Seville, Ohio 5 Aug 1888). In 1862 she joined P.T. Barnum's American Museum in New York, attracted by the monthly salary of $1000 and by the opportunity to further her education through private tutoring. She became one of Barnum's star attractions. Promoted as being 246 cm (8´1´) tall, Anna was in reality 228 cm (7´6´), and at age 22 weighed 160 kg (352 lbs). When the museum burned in 1865, it took 18 men with a block and tackle to rescue her. 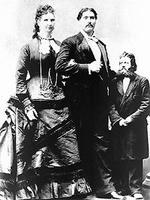 In 1871, during an overseas tour, Anna met and married Martin Van Buren Bates, a Kentucky giant. They were presented to Queen Victoria, travelled throughout Europe, and then settled on an Ohio farm; summers were spent touring with the W.W. Cole circus. Before her death from tuberculosis, Anna had 2 children; both were abnormally large and died within hours of birth.